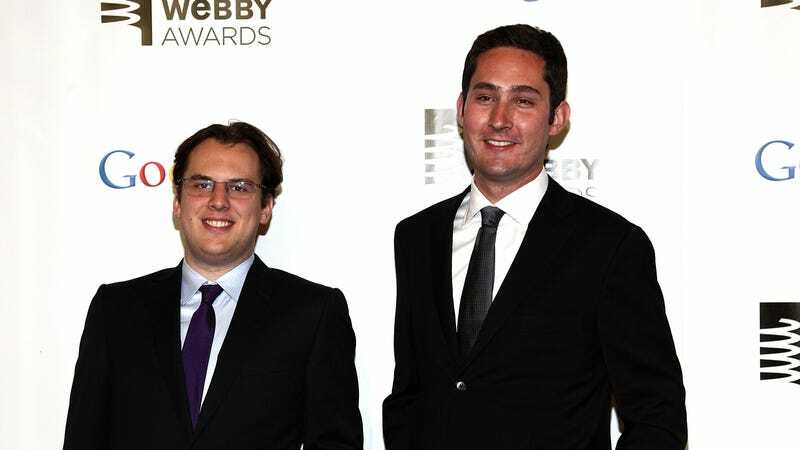 Instagram co-founders Mike Krieger (left) and Kevin Systrom (right) at the 2012 Webby Awards. Instagram co-founders Kevin Systrom and Mike Krieger plan to leave their jobs at the company in the coming weeks, according to a report in the New York Times on Monday. The co-founders later confirmed the news on Instagram’s blog. Mr. Systrom and Mr. Krieger did not give a reason for their departure, according to the people, but said they planned to take time off after leaving Instagram. Mr. Systrom and Mr. Krieger have known each other since 2010, when they met and transformed a software project built by Mr. Systrom into what eventually became Instagram, which now has more than one billion users. A spokeswoman for Facebook, which owns Instagram, did not immediately have a comment. Instagram is one of Facebook’s most important properties and recently hit a reported 1 billion users. Though its goliath owner has weathered a number of controversies as of late—such as the immensely damaging Cambridge Analytica scandal, Facebook-engineered election interference, and use of the site to incite violence—without more detail, it’s unknown whether the co-founders are reportedly jumping ship over the string of scandals or for other reasons. However, another well-known magnate of a Facebook subsidiary, WhatsApp co-founder Jan Koum, resigned from both his company and Facebook’s board after reportedly becoming concerned executives planned to undermine the encrypted chat service’s security for marketing purposes. As Facebook saw a threat in young people departing the network for Snapchat, a rival photo-sharing network, Instagram was quick to shift and recreate one of Snapchat’s key features of online stories. Since then, Instagram has surged further in popularity, while Snapchat’s growth has been inconsistent. The executive shuffle also creates an open question of who will take over leadership roles at Instagram, whose former chief operating officer Marne Levine, the Times added, returned to Facebook this month. Updated September 25 with new info from Instagram.